Punta Cana is one of the largest single destination for golf in the Caribbean. There are about dozen golf courses in the Punta Cana and almost 30 in the whole of the Dominican Republic. The golf courses are being built and remodeled all the time so check with the golf course for the update on the course you would like to visit. 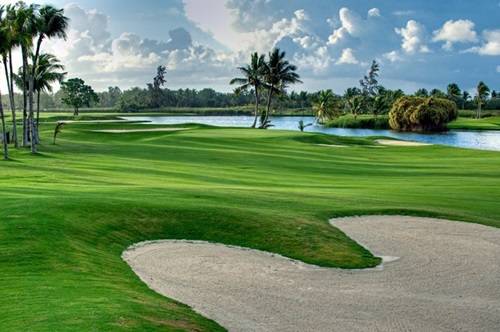 Another very popular golf course is Punta Cana Golf Club, near the Punta Cana Resort & Club. This golf course was also designed by Pete Dye. Here on most of its holes one can enjoy panoramic views of the Caribbean Sea. Corales Golf Course 18 72 Open to residents and their guests only. A good map of golf courses near Punta Cana can be found at PuntaCanaGolf.net. Ratings and reviews of various golf courses in Punta Cana and around Dominican Republic can be found at these sites. Besides that they also offer much more detailed information for golfers.